Mulch is an easy inexpensive way to improve the look of your landscape. Mulching around trees not only cleans up the look and hides roots, but it prvents any damage that could occur from mowers or string trimmers. We provide mulching services that are customized as per your needs. Our mulching services help give your lawn a neat, finished look that enhances its appearance. We are using an organic mulching materials that are a great source of nutrition to your lawn. 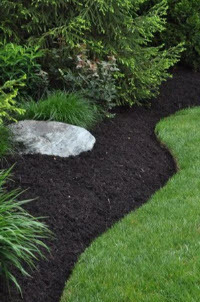 Weeding, edging, and applying new mulch to an old bed can revitalize the look of your home. Call us to arrange a meeting. in Bridgewater area in New Jersey.